Long before search engines were used, new websites were discovered via directories. Then came Google whose creators were more focused on links, valuable ones, those used by authoritative and quality websites. An online directory is a website submission service. When you submit a website, it is added under a proper category in a searchable online directory. This, in turn, enhances your site’s visibility and creates relevant inbound links to your website. Well-known search engines such as Google use prominent online directories to find search results. When you search for something online via a search engine, its crawlers scan multiple web pages listed in various online directories in order to provide results. If your site is indexed and categorized in an online directory, it is considered to be relevant. Thus your site enjoys a higher ranking. When you submit your site on an online directory, it creates inbound links. When your site is listed in a prominent online directory, it gains quality inbound links and thus enhances your website’s visibility. Submitting your site to an online directory is a cost-effective manner to get backlinks. Thereby, it establishes a great foundation for internet marketing. Speaking of DMOZ, the Open Directory Project (ODP) was the king of ODPs. It was founded by Bob Truel and Rich Skrenta in 1998 in the United States of America. It was initially called as Gnuhoo that was loosely based on Usenet newsgroups’ structure. The Gnuhoo directory was changed to be called as NewHoo. Now, Yahoo! objected the use of Hoo after which the name was again changed to ZURL. When DMOZ was still NewHoo, Netscape Communications Corporation acquired it in October 1998. It was then that the directory became an Open Directory Project. Netscape released the ODP under the Open Directory License. Later, when AOL acquired Netscape, DMOZ was one of the acquired assets. When Netscape still owned the ODP, it had about 100,000 URLs indexed and around 4500 editors. By October 5, 1999, the number of URLs indexed in DMOZ reached a million. In Aril 2000, the URLs in DMOZ had reached a whopping 1.6 million, much more than what Yahoo! Directory had indexed. In the same year, in August, DMOZ had indexed over two million URLs. By April 2013, the number of indexed sited skyrocketed to 5,169,995 listed under 1,017,500 categories. The number of editors had also increased to reach as many as 97,584! DMOZ ruled the SEO world for 19 years and its closure on 14 Mar 2017 marked the end of an era. It is still the most comprehensive directory that is constructed and edited by humans. It is maintained by a global community comprised of passionate, volunteer editors. DMOZ listing checker is an important tool that plays a major role in terms of the SEO analysis of a particular website. It helps you to find if a particular site is listed in DMOZ. Some tools also allow you to carry out bulk queries. The DMOZ listing checker also shows a list of categories in which a particular website is listed. DMOZ is a categorized directory comprising of websites and pages. These are reviewed by the volunteers before any content is included. They remove the bad content and keep the best and thus, organize a portion of the internet and make it presentable to a larger population. DMOZ is the only directory that is totally free, which means there are no costs related to the submission of sites to the directory. Further, the usage of the directory's data is also free. All you have to do to access the data is to meet their compliance regarding free use license. Moreover, DMOZ is the input to the major and the most well-known portals and search engines such as Google, HotBot, AOL Search, Lycos, and many others. However, the domains which were listed in the DMOZ directory have more to their credit, even after the closure. Though DMOZ isn’t used to search like Bing or Yahoo, it still crucial for the functioning of Google. This is because Google gives special consideration to DMOZ’s listing. Therefore, the websites listed in DMOZ are considered to be trustworthy and are hence ranked better. One of the reasons is because DMOZ has a crazy PageRank, which was previously used by Google. PageRank is a major component of the ranking algorithm used by Google. Thus, if your website is listed in DMOZ, the PageRank will undoubtedly increase by DMOZ’s listings. This is because your website will have one strong link from DMOZ and another from the Google directory. Naturally, any websites listed in DMOZ will have a better ranking. However, getting listed in DMOZ is not easy, it is time-consuming. With scores of submissions on a day to day basis, very few editors can actually review all of them. Also, you must be careful not to submit to the wrong category, if you do, the approval may take forever. How to list your website on DMOZ? Click on the “Suggest URL” option. Before doing this, ensure that your site is up to DMOZ’s standard. It should also have relevant information. With this background, read about the DMOZ Listing Checker tool. 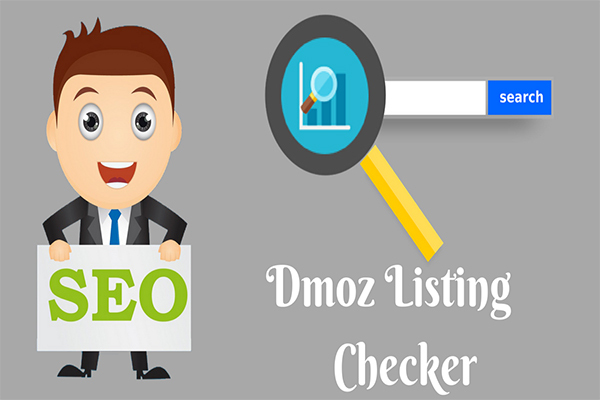 The DMOZ Listing Checker tool is an SEO tool that checks if a particular website has been listed on DMOZ. How does the DMOZ listing checker work? Enter the URL(s) of the website/websites in the text area. Then, click ‘Submit’and wait until your data is processed. Once the data is processed you will see the results in a table. You can save the results locally on your system. Do this by exporting the results in an excel sheet and click ‘Export’. What are the benefits of DMOZ listing? DMOZ directory doesn’t accept every website or webpage. Only the best ones as decided by the DMOZ’s editors are considered and approved. Thus, if your website or webpage is listed in the DMOZ directory, then the same will be considered more valuable compared to your competitors. DMOZ listing can get your website on the top of search engine results. Major search engines like Bing, Yahoo, Google, and MSN go back to DMOZ directory and look into it for new domains while ranking websites. So, use the DMOZ listing checker and use it to strengthen your online marketing strategies. With the help of Dmoz listing checker tool, it will check and analyze your website that has listed or not in the open Directory. If the site is listed in Dmoz, the tool displays site is listed otherwise not listed in the directory. The beauty of Dmoz listing checker tool is to check your domains all at free of cost, it can check up to 100 URLs at a time in Dmoz open directory.